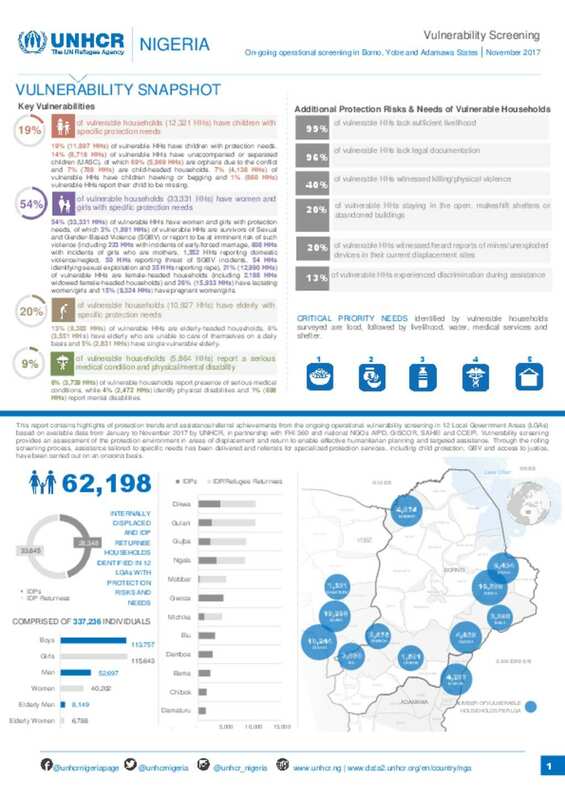 This report contains highlights of protection trends and assistance/referral achievements from the ongoing operational vulnerability screening in 12 Local Government Areas (LGAs) based on available data from January to November 2017 by UNHCR, in partnership with FHI 360 and national NGOs AIPD, GISCOR, SAHEI and CCEPI. Vulnerability screening provides an assessment of the protection environment in areas of displacement and return to enable effective humanitarian planning and targeted assistance. Through the rolling screening process, assistance tailored to specific needs has been delivered and referrals for specialized protection services, including child protection, GBV and access to justice, have been carried out on an ongoing basis.